For the record, the proper pronunciations are Jin’Sorai, Tel’Dora, and Mor’Kama. Todd was close, kinda. Some readers may recall a previous Secret Commentary where I mentioned the word "kransa" in the "kransa bi cholek" cuss word Selkie's thrown out intermittently meant "teeth". 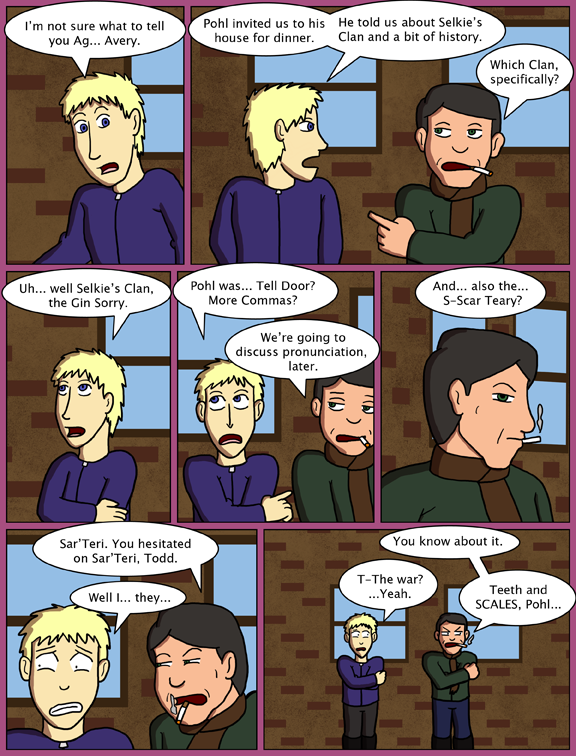 "Teeth and Scales" is the translation of the entire phrase. It's an invective, a dire insult, and very very rude to say; it's also a fairly common "anger phrase", comparable to the F-Word in English. It references a darker member of the Sarnothi spirit pantheon, Kehl Nin Fa Tho. He's associated with doom and destruction and takes the form of a school of spectral trout with translucent ribs violet eyes and rending teeth. “Avery”… You yourself kind of hinted there was one. Honestly, pieces can be put together, even if details are scant. Don’t be too hard on Pohl. The teeth man… the teeth. I do love that single fang. I wanted to use a species of fish that would be naturally found in the Great Lakes without using magical author wizardry to say “In this universe the Great Lakes have barracuda.” (From what I was able to google fresh water barracuda do exist, but I couldn’t see where they live in the Great Lakes). I also kind of like the idea of the Doom God being symbolized by such a seemingly innocuous fish. I don’t understand why trout was brought up. Or why you mentioned that eel god. (Unless the sarnothi god is a trout). 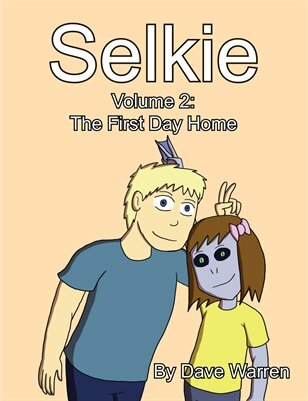 So far it’s been unclear (to me, at least) whether this comic is about an intelligent species that evolved on Earth without being noticed by humans, or an extraterrestrial species that took refuge here. But if they have a mythology that includes Lake Superior fauna, then I suppose that tells us that they’ve been here for quite some time. Dave: ah OK. I also remembered after posting to use my Google-fu and realized that trout are carnivorous and eat eel. Plus go between sea and freshwater, at times… That could have symbolic significance for a carnivorous freshwater-only species that reveres an eel-god. Agent Brown curses in an English translation of Sarnothi (spell?) language. I OBJECT TO THIS CENSORSHIP! Agent Brown CLEARLY meant “Sturm und Drang, Pohl!” in that last panel! This conspiracy to obscure foreign possibly-swear words with other foreign possibly-swear words shall not stand! Observe as I use the vulgar words dang and feces in response to this! Observe my use of the forbidden word “crimp”! Now you will have to edit that out! And adding such flavor to a story makes everything so much fun! Dave> I love your explanation of the curse word in your Transcript. So much depth and research! You go! The “More Comma” comment is making me try really hard to think of a “More Cowbell” joke. That and I’m fairly sure Todd (or was that Dave) meant “more apostrophes”. I like how Avery has adopted Sarnothi curses. Nicely subtle way of showing how much time he’s spent with them and how much he’s gotten used to them. That joke said YES!, Avery’s done real well at this 😀 a great international agent he is. I somehow see “Did you tell Selkie?” “No.” “Good. DON’T” coming soon. Not knowing if Pohl knows how classified the war is, I don’t know how critical to be to who. And even with what Pohl has said, it’s clear from the way he acted at the dinner that there’s a lot more he didn’t. Also don’t know if I would have chosen any differently than Pohl did – Selkie’s from a clan that’s almost gone, and she has a right to know that. How they ended up almost gone would be a reasonable follow up question to be asked. well, with Avery swearing like that i guess that qualifies as a BIG s#$t, huh? Now comes the fun part… him asking the next obvious question: who else knows about it? and then after that, Todd’s question of: what’s going to happen to US? I would just like to point out that the two arrows next to the white RSS are practically invisable.